Today I would like to share how I helped Andrew’s business Room with a View – Window cleaning. Andrew started his business over a year ago and up until now his sole online presence was his Facebook Page. Facebook can be a great way to interact with audiences and share updates with customers. However people must like your page to see your offerings and updates. Andrew spent a lot of money on facebook ads trying to promote his business. He was finding it hard to get his services in front of people through Facebook alone. So he called me to enquire about a web design for his small business. Andrew reached out to us on our blog after reading my blog post “Reasons to get a Professional Website”. In this article i shared my insights into why a website is still relevant when doing business in 2019. What we include in our web design for business bundles. Andrew decided to get us to design a Brochure website for his business. A brochure website is like a printed brochure but online. It would allow him promote his work to people outside of Facebook and build trust. Having a professional website builds trust with new customers which is vital if you work in the customers homeplace. Web design for small business needs to be fast, easy and within startups budget. I built Andrews website in a way that captured his friendly personality while oozing professionalism. He works very hard maintaining peoples homes all around Meath. I wanted to provide a solution that allowed people contact him any time. 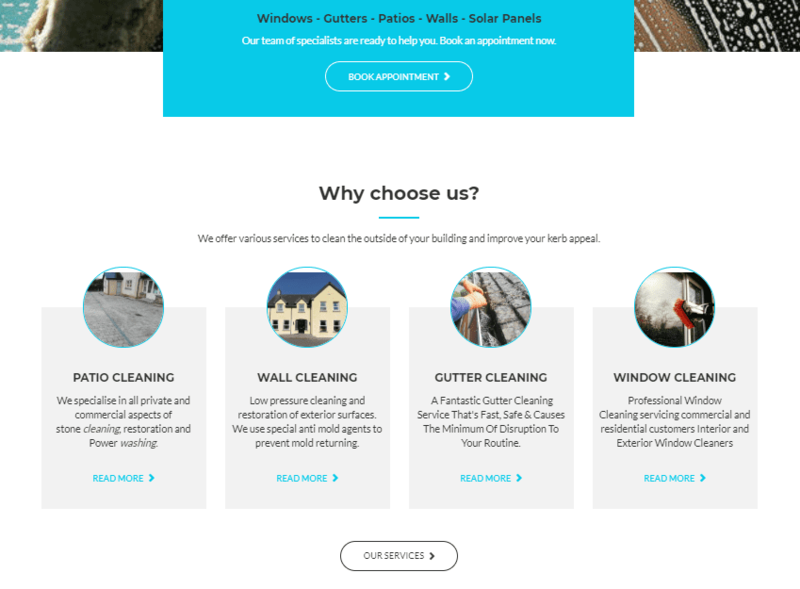 I also wanted people to discover him when looking for window cleaning services in Meath. Cleaning windows, gutters, buildings, patios, solar panels and walls. Andrew has helped many homeowners transform their house in the past few. I wanted to champion this in his new web design. He had dozens of fantastic “before and after” photos of the work he has completed. We wanted people to be able to browse his prior work and book him in seconds. I also wanted the website to be responsive and work on peoples mobile, tablet or computer. Full SEO was performed on the website for launch last week. I am continuing to load images on to the website for Andrew so that he can promote it online. I hope that Andrew has lots of success in 2019 with his new website. Web design for small business is what we love to do. It is very rewarding to see our clients succeed and grow. If you would like to grow your business and reach new customers please get in touch. We can design your new website within 7 days and can help you build trust with new customers.